Though the collaborative process may not be the cheapest in all cases, it has a substantial opportunity to save you money as compared to the courtroom battles we have all come to associate with divorce. 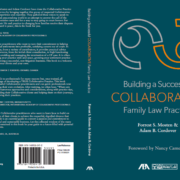 First, child issues, such as custody schedules and decision-making authority, are some of the most emotional and costliest issues in family law matters. Lawyers in courtroom cases tend to prepare interrogatories (questions) to be answered under penalty of perjury, set depositions, conduct opposition research to put the other spouse in the worst possible light, and prepare for trial. Attorneys’ invoices pile up along each stage of this process. Alternatively, these fees and costs can be greatly reduced in the collaborative process where facilitators, who usually are licensed mental health professionals, can cut through the clutter of emotionally-charged issues and bring the clients (and lawyers) to focus on the future and best interests of the children. Similarly, a financial professional (who is usually either an accountant or financial planner) adds cost-saving value to the process. In litigated cases, lawyers prepare “requests for production of documents and things” that demand reams of financial documents which could conceivably be relevant. Searching for those documents cost clients tremendous time and money while, when received, the requesting attorney will spend countless billable hours meticulously combing through the documents. In the collaborative process, on the other hand, the financial professional will only request documents that are necessary to make an informed settlement option. His or her expertise in finances enables the financial professional to review and assess the documents and develop settlement options more quickly (and often times at a lower rate) than attorneys. Finally, the dirty little secret in family law is that the vast majority of litigation cases eventually settle. However, because having a judge decide on the parties’ personal matters always remains a threat, in traditional courtroom divorce the attorneys will always work on two tracks: (i) attempt to settle the case while (ii) conducting opposition research and preparing for the courtroom battle in case the parties cannot come to an agreement. In the collaborative process, attorneys are retained solely for the purpose of settlement and are contractually barred from taking disputes to be decided in court, and so they are not racking up those billable hours planning to fight it out in court. If you have questions regarding how a Tampa or St. Petersburg collaborative divorce process can help you, schedule a consultation with The Law Firm of Adam B. Cordover, P.A., at (813) 443-0615 or fill out our contact form. Adam B. Cordover is Vice President of the Collaborative Divorce Institute of Tampa Bay and is a member of the International Academy of Collaborative Professionals. Adam served on the taskforce that drafted the Hillsborough County collaborative family practice administrative order signed by Chief Judge Manuel Menendez.